For those who aren’t lucky enough to have played the delightful AGoT2e: A Dance with Dragons expansion, especially those who are allergic to spoilers and have only watched the TV show, this is a custom scenario to add some flavour to your game of thrones experience. It’s nowhere near as good as the vanilla game, but having played vanilla a lot, I think it presents players who know the factions well with a different way of harnessing their unique abilities. The inspiration for the scenario is the state of geopolitics in Westeros circa the end of season 2, presumably just before the finale. Obviously it wouldn’t be very FFG of me if I hadn’t tried to marry theme with functionality, so as much of the canon as possible is interwoven with the balancing of each side. Looking at possible opening moves and immediate successive moves, and considering the numbers of units and house cards available on all sides, with any luck each house has roughly the same chance of winning, or at least getting off to a good start. This has been playtested once with reasonable success. I invite you, reader, to test it yourself and improve on it if you want. I have also tried to provide each faction with a major choice to make at the start of the game, generally mirroring the unfolding of events in the story of GoT. I made this shortly before the ADwD expansion came out, so the very apparent similarities are a coincidence and not an attempt at copying or at board game piracy for the masses. It’s also worth noting that this scenario was made with the original house cards and general setup materials in mind, so is liable to go absolutely to hell if it gets played with the expansion cards. The only circumstantial changes to the board that I recommend are disregarding the King’s Landing garrison, moving the Dragonstone garrison to Storm’s End, adding one imaginary supply barrel to Storm’s End, and ignoring the default Stark power marker printed on Winterfell. You can also add a port to King’s Landing for Lannister’s sake, but the jury is still out on that one. Players should start with 10 power tokens rather than 5 to offset the lack of power availability for most houses in the opening turns. Wildlings can start on 6 just to make things more exciting. One final note: The map image is from a board game simulator program called VASSAL, which, while terrible for actually playing board games, is well furnished with high resolution images of components. Lannister is in the middle of it all, the axis on which the other houses turn. Defending the right to both Lannisport and King’s Landing, his army is split in two with enemies approaching on both fronts. From the north, the Starks come for grim justice. From the sea, Stannis’ long-awaited fleet and an army of men with ladders are ready to reclaim his seat of power. If both Stark and Baratheon decide to go ahead with their attacks, with the maximum force available, then Lannister will find himself only able to defend one of his centres of power by playing his Defense+2 order in the way of an attacker. The Messenger Raven will help resolve this by deferring the decision until the other players’ intentions are clear. However, King’s Landing may also summon the support of an ally, Tyrell, should he choose to offer it, in the Reach to bolster the defence and make it possible to protect both strongholds. Lannister starts with two of the dominance tokens, giving him the necessary tools to orchestrate a reversal of his highly vulnerable position and restore order to his land. These also make him a powerful ally, putting him in a strong bargaining position with other players who are willing to trust him. Stark’s initial position is precariously scattered, poised to storm Lannisport but also losing the battle for the north to Greyjoy. The defining decision for Stark is clear: either defend the north and reclaim Winterfell or attempt to conquer the south with an unstoppable force. Although the road from Riverrun to Winterfell will be rife with Greyjoy harassment, the force of Stark’s 3 knights, backed up by the Valyrian Steel Blade, should be enough to forge a blazing path through the contested territory in the neck. Meanwhile, the forces at Castle Black and Karhold can pressure Greyjoy into investing high valued cards if he intends to hold Winterfell. On the other hand, with Lannister divided as he is, Stark may choose to abandon the north and conquer the middle of the map and the bounty of castles therein. Stark’s positions on the influence tracks make him akin to a vanilla Greyjoy; a highly aggressive juggernaut who must attack to survive. However, this Stark has the benefit of a single special order to tip the balance on one front or another. Thematically, he is Robb Stark, the treasonist who defies the throne and annihilates his enemies. Baratheon meanwhile stands on the cusp of Stannis’ glorious but (potentially) ultimately doomed charge on King’s Landing. His forces are concentrated in Storm’s End, and he has Lannister’s navy cornered. The decision for him is whether to make the fateful voyage to King’s Landing and secure a lucrative victory or an incredible defeat. If Stark and Baratheon work together, then Lannister’s early prominence can be curbed for the benefit of both. In particular, Baratheon can leverage Stannis’ text ability versus Lannister to overcome all but the most invincible of defences. However, Tyrell can still unravel their scheme, which may drive Baratheon south to meet the much more manageable Martell instead. His positions on the influence tracks put Baratheon at an initial disadvantage against all neighbours other than Martell (whose sea he can take and hold on turn 1 if he wants), and the lack of special orders will be stifling, so he will have to exploit his numerical advantage to win the early skirmishes. Baratheon definitely has the weakest position in this setup, and hence should probably be taken on as a challenge rather than a path to victory. Martell’s starting position is fairly neutral, with no clear enemies or allies. With this in mind, he is free to expand and accumulate troops, or organise an offensive against Tyrell or Baratheon to shift the balance of power against the stronger side. There is no crucial decision for Martell in this scenario as they are kind of a blank slate at this point in the canon. Not much can be done about that. The lure of Martell in this game is its familiarity; aside from a few new geographical quirks, it’s business as usual for him. In fact, Martell is so vanilla you can play the scenario without it as you would in a standard 5 player game. Marauding the Bay of Ice and pillaging the Stony Shore, Greyjoy’s natural rally point is the defenceless Stark heartland of Winterfell. However, with the Blade out of hand and in the possession of a potentially furious Stark, Greyjoy doesn’t have the usual assurance of military superiority, and his most potent house cards (Balon and Victarion in particular) become more precious and all the more important to his grand plan. So Greyjoy may choose wage a bloody and cerebral war against Stark for control of the coveted north, or he may be coerced into withdrawing and combining their similar strengths towards a common goal. In any case, the larger size of Greyjoy’s domain and the reach of his armies across the coast make his characteristic navy even more useful for convoying armies and launching amphibious assaults from early on in the game. Tyrell starts in a comfortable position, only bordering Lannister and having plenty of uncontested lands under their control. However, their army is the joint smallest on the board, so they need to co-operate at first to succeed. The first decision Tyrell is likely to make may decide the course of the game; to support in favour of, or against, Lannister in King’s Landing, or to abstain. As mentioned above, if Tyrell supports Lannister then he can keep control of both King’s Landing and his capital - with careful order placement. The benefit of this to Tyrell is the solidification of an alliance with a very strong and influential player who can offer land, security, and favour in bidding. On the other hand, this course of action may create a superpowered Lannister with advantages both on the influence tracks and on the board. Tyrell’s influence positions are divergent from the vanilla game. He has the option of playing more conservatively and using special orders to muster, spread out and defend rather than racing to destroy units with Mace and Loras before he gets overrun. If you are the kind of person who likes to talk AGoT2e strats on the internet, feel free to use the comments below for lively discussion, opinions and rage. Which is your favourite character to play and why? In vanilla, I like Greyjoy the most because in general I prefer to play aggressively from the start, and their boat convoys offer a nice variety of routes to attack from. In this scenario, I don't know because I've only played it once, as Greyjoy coincidentally. I do agree with you on the expansion, but if that's how the designers thought it should be then I think it was worth it. There is a nice breadth of new characters with cool abilities inspired by the events in the books that might not have been plausible if it was based on an earlier scenario. Martell for example aren't even on the radar in the show at this point. What I like about board game is how you think of your strategy and the probability of winning the game, just like the probability of winning in other games like poker, good thing there are poker rules for beginners sites that we could read over the net. 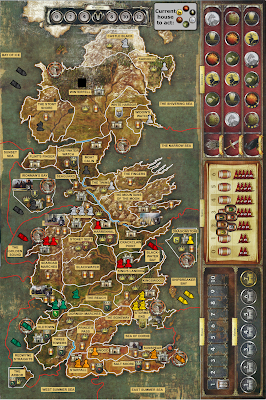 From everything I've read, it seems like a three player game should just disregard the lannister house and the third should play as greyjoy.